In 2007, Getty Images found that imagery licensing by corporations and agencies representing the Medical and Pharmaceutical industries had decreased noticeably over the past year. Research showed that these groups needed lifestyle imagery that included diverse ethnic groups, generational families, people of color, couples, and active outdoor shots. Their researchers also noticed a trend towards using images that showed business people working and talking with doctors in white lab coats. All of these groups placed importance on branding the end client, and to keep their clients’ imagery distinctive, frequently would license imagery on an “exclusivity” basis, so their competitors were not using the same photos in their marketing. In order to drive business from this sector, Getty Images wanted to run a targeted, integrated campaign that offered special pricing on Exclusivity imagery protection and Flexible License Packs, with options to suit all needs and budgets, and to convey that it had the industry’s premiere products and services to exceed customer’s campaign and branding needs. We presented several concept options for this campaign, and the chosen idea played off the popular dating site, Match.com, as an unexpected way to show that Getty Images has the perfect match for any type of image this target market was searching for. Several targeted emails and two direct mail pieces, sent over a four-month period, drove people to a custom microsite, which highlighted the diversity of Getty’s people photos and allowed people to search for images. As a result, sales to this target market increased over 15% for the year. We presented five concept options for the direct mail piece that would launch this campaign, all of which would stand out in the mail and intrigue the recipient enough that they would open the piece. Getty Images selected the, “Find your perfect match” concept, which played off dating sites like Match.com. 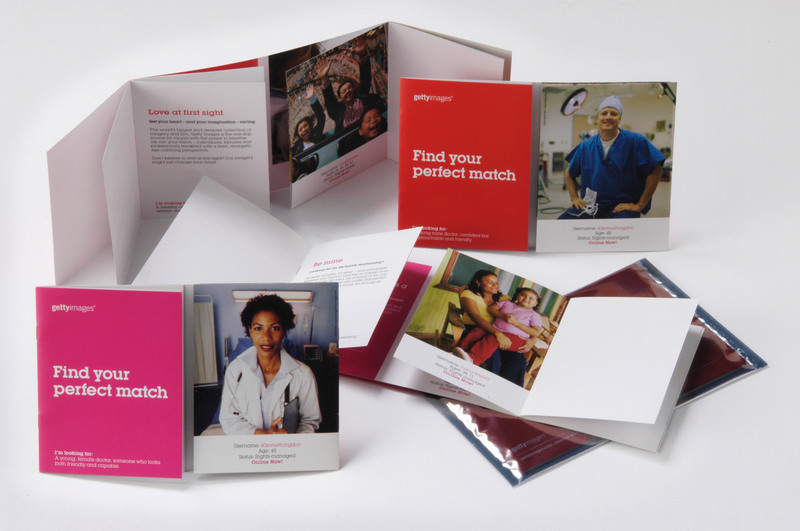 These interactive brochures play off of the idea of an online dating site like match.com, showing pharmaceutical and medical industry targets that Getty Images has the right kind of people images to fit their needs. The left-hand side of each brochure features targeted messaging and descriptions of the type of people they are looking for such as “active senior,” “doctor with professional,” “Hispanic mother,” etc. The right-hand side of each brochure features rights-managed people photographs that match the aforementioned descriptions. Like a dating site, each photo features a profile describing the subject’s age, occupation, etc. The exclusivity / flexibility offer is featured on the back cover, and drove the recipient to gettyimages.com/match to see more images and search for themselves. Emails were sent each month for four months, driving the target market to the microsite. Want to engage a compatible marketing partner?